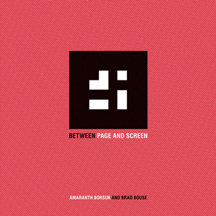 Amaranth Borsuk and Brad Bouse’s Between Page and Screen is a singular book of literature: aside from the colophon and cover, the book contains no text. Leafing through its seventeen pages, one finds instead a series of white abstract geometric shapes enclosed in black squares, beautiful in their own right but a far cry from legible in any conventional sense. To “read” the book—or perhaps more accurately, to access the words coded into the page’s geometric ciphers—one needs a computer, a web browser and a web cam. Navigate to the book’s site, betweenpageandscreen.com, and you’ll find yourself looking at an image of yourself holding the book you can’t yet read. The strangeness of this experience is striking—seeing oneself mirrored through the eyes of the technology that makes legible the world around one. Open the book and angle it back and forth before the eye of the webcam (the website offers helpful tips on how to present page to screen), and letters spring up out of the page on the screen, assembling themselves into words and blocks of text. The book’s title is, among other things, a quite literal description of the condition of the book’s mediated textuality. The words that make up this book aren’t bound between its pages; they exist in a virtual space. Written language is so ubiquitous, we often take it for granted as a natural extension of spoken language—but this isn’t the case. The development of the phonetic Greek alphabet in the early eighth-century BC was revolutionary—and was, crucially, a technological revolution. 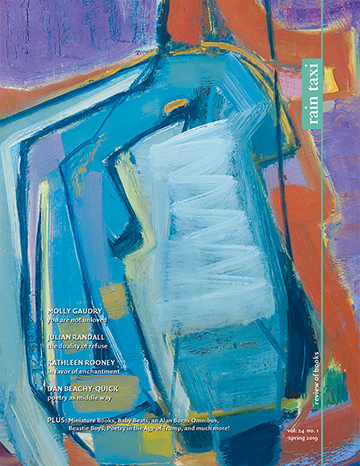 As the technology of writing continues to evolve—from the printing press to the typewriter to the personal computer, to name just a few of its manifestations—it continues to transform and challenge the possibilities of what can be called literature. Of the experimental works that mine the literary/technological frontier, those that succeed most exploit the possibilities of their technology as a “material metaphor” to embody the subject matter with which they engage (see, e.g., Katherine Hayles, Writing Machines). Or put another way: it’s too easy, in the age of digital reproduction, to fall into the trap of the gimmick. Which offers all the more reason to marvel at Borsuk and Bouse’s impressive technological/literary feat. Between Page and Screen is a self-reflexive work that seeks to understand print and digital media—and the tensions between the two—in ways that are poignant, smart, and funny. Not the least bit gimmicky, Borsuk and Bouse’s use of the technology of augmented reality is inventive, dynamic, and surprising. The book is written/programmed in two interleaving modes. Roughly half of the book’s pages feature a story told through the stereoscopic lens of letters written between the characters “Page” and “Screen.” But between these letters, readers will encounter dynamic texts that move in three-dimensional space, words that rearrange themselves into derivative combinations and permutations, or are arranged, in the style of concrete poetry, into representative shapes. Though not set explicitly in any one time period, the texts, replete with puns and other literary word play, use a register that often feels archaic: “I prefer arras to arias, you’ve guessed, a bard of scabbards, a chorus of cuirass,” writes “S.” One page of the book is a block of text ornately arranged into the shape of a shield that features the definitions and etymologies of five interrelated words “scaramouch,” “scrimmage,” “skirmish,” “scararamouch,” and “screen.” Borsuk and Bouse’s historical/etymological thrust gives depth and new life to the contemporary debate about the fate of print media in the age of the digital. Page and Screen, who flirt just as much as they fight, struggle to define themselves in relation and opposition to one another. Page is defensive in her first letter to Screen: “Dear S, I fast, I fasten to become compact, but listen, that’s only part your impact.” “Page, don’t cage me,” Screen responds in a later letter, “Why this mania to define what’s between us?” Their playful skirmish is never quite resolved, but we are left feeling that page and screen need one another, and will find a way to coexist—which, of course, is embodied perfectly in the book’s materiality, which requires both page and screen to bring the words in between to life.